Comfort Bath Washcloths from HealthyKin.com are easier for caregivers and easier on skin. Providing basic hygiene for a loved one can be an overwhelming task for a caregiver. Getting someone with limited mobility to a tub or shower can make bathing not only difficult and time consuming, but also potentially dangerous. Now, Comfort Bath is making bathing a more pleasant experience for everyone involved. Comfort Bath is a rinse-free, full-body bath for anyone who has difficulty getting into the tub or shower. In fact, it eliminates the need for any water source or additional supplies, saving both time and effort. These soft, thick washcloths are soaked in a unique blend of mild cleansers and skin-protecting moisturizers. They leave skin feeling soft and smooth with aloe and vitamin E. The insulated package can be conveniently warmed in the microwave and stays warm throughout the bath. The ultimate cleansing solution! 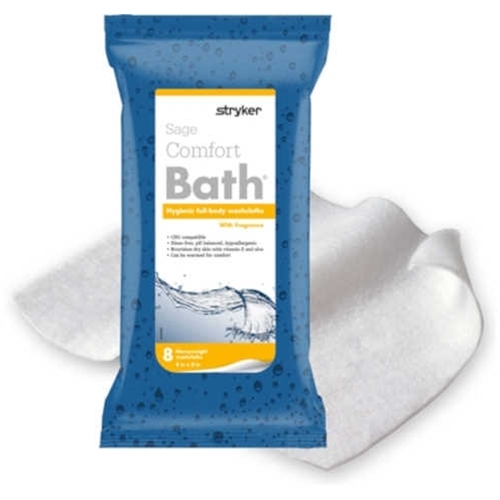 Comfort Bath features a deodorant to remove odors on contact. Instead of just masking odors with fragrance, Comfort Bath's exclusive deodorizing ingredient entraps odor molecules to permanently eliminate offensive odors. You don't have to worry about Comfort Bath washcloths not holding up during bathing. Our washcloths have superior strength, yet are extremely soft and comfortable, even to the most fragile skin. Compared to ordinary thin, flimsy wipes, Comfort Bath provides a stronger and easier alternative. Comfort bath is a wonderful substitute when you can't do a full bath. We use them one at a time for smaller cleanups too. HealthyKin has the best price too. With my disability, bathing is not possible. I have been using these cleaning cloths for many months and they are wonderful. These came recommended by my doctors office and HealthyKin has the best price. I couldn't be happier. This is the best bath cloth in the market place. This company has the lowest price I have found in the marketplace. These bathing cloths have absolutely saved the day for us. We are most often not able to do a full bath or shower, and the bath cloth allows us to provide a pretty good facsimile: easy to use, thorough cleanses, smells good. The product delivery was also excellent!! I am an RN and familiar with the product as we used it in the hospital where I previously worked. I broke my leg and had to be in a camper for two weeks and purchasing this product was the first thing I thought of. I only had to use half a package at a time. Worked great and your price was the best. Purchased these for my disabled father. My mom absolutely loves them. A wonderful product for Caregivers who want the most effective cleaning washcloth.